Nepal has suffered a total of 49 quakes with magnitude more than 4.5 on Richter scale in past few weeks. It is a time of great pain and agony for our neighbors. 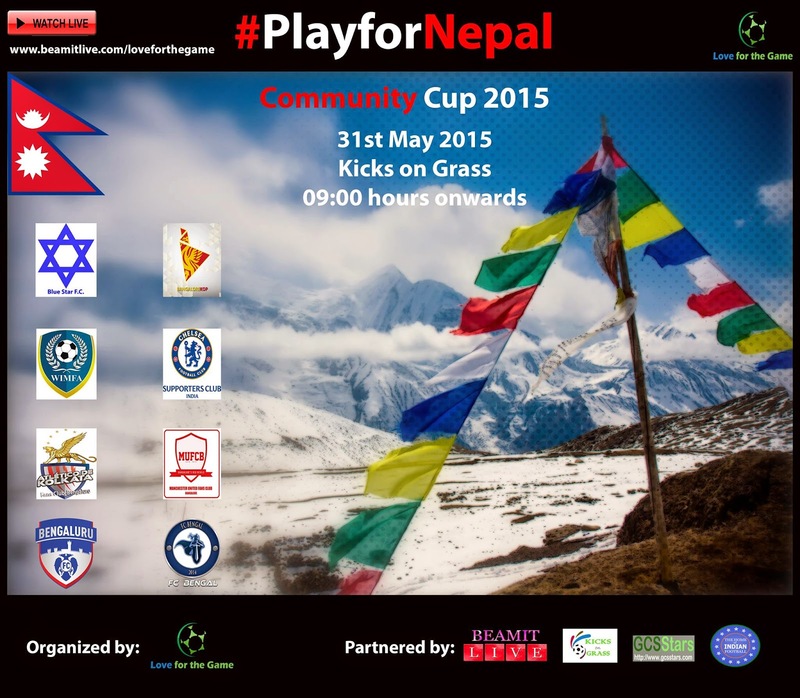 Organizer, www.loveforthegame.in, is hosting back-to-back events to help raise funds for Nepal. 8 teams battle it out on a knock-out basis to determine the champions in this 8-a-side (with 4 rolling subs) tourney. One-off duel between the Bangalore-based fans’ club of Kolkata giants – eternal rivals Kingfisher East Bengal and McDowell's Mohun Bagan. This is much more than football, they will be playing for pride, for humanity, and above all they will PLAY FOR NEPAL. No cash prizes in offing for these events, money collected will be donated. The winning teams would definitely cherish the Winner’s trophy which would be presented to them. Both events will be streamed live on the internet via our Broadcast Partner BeamitLive - http://beamitlive.com/loveforthegame. Kicks on Grass already have been very generous to lend their support by becoming Venue Partners for these events. www.gcsstars.com and thif-live.com are the Media Partners. Necessary information is available here - www.loveforthegame.in or visit the FaceBook page - https://www.facebook.com/pages/Love-for-the-Game/1596977423850359?ref=br_rs.